Blue Splasher Pool 12ft x 36"
Splasher Pools > Blue Splasher Pool 12ft x 36"
These lovely 12ft x 36" deep and 15ft x 36" deep Blue Splasher Pools come with FREE DELIVERY! and all the toppings! Included in the Blue Splasher Pool packages are: Galvanised Top and Bottom Rails, Pool Wall System, Painted Vetical Supports, Ladder, Filter Pump and a Winterised Liners to offer you the best solutions for a pool of its type. These lovely Blue Splasher Pool Packages offer you and your whole family hours of swimming fun as they come complete with all the extras you may need. The Blue Splasher Pool represents top quality value for money and is perticularly suited for children as well as adulds. 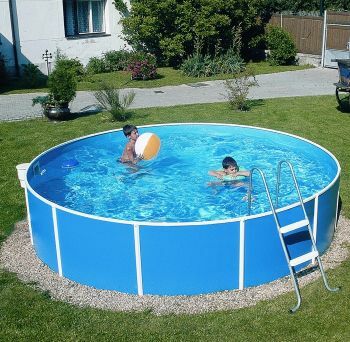 These pools also come in different sizes of 12ft and 15ft. The 12ft x 36" deep splasher pool comes with the blue wall finish, or alternativly you could pick one of the 12ft or 15ft x 36" deep models which come in a grey woodgrain effect finish along with the blue liner. Why not take a look at the Deluxe Splash, if you are after a deeper pool, which has a grand depth of 42"! While the Blue model of this splasher pool has a pump which is an intergral part of the skimmer housing unit - meaning it cannot use an ecetrial heater - the grey models all come with an external pump and filtration system, meaing you're able to accept heating equipment to be added. If required a seperate skimmer and pump pack can be purchased to take a heater or heat pump for the Blue model.